2019 has arrived and the gang is back on Source Material to bring you their discussion on a classic from DC Comics. 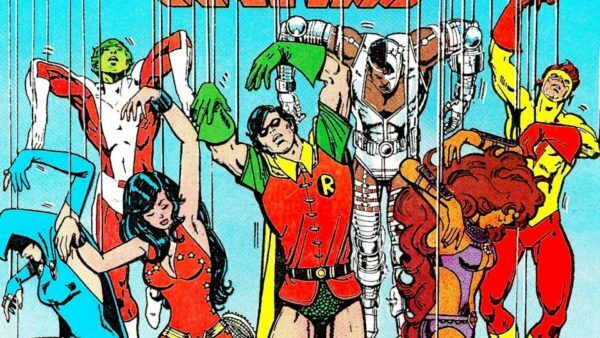 The New Teen Titans burst onto the scene in 1980 thanks to Marv Wolfman and George Perez. Jesse Starcher and Mark Radulich welcome back contributor to The Unspoken Decade,” Chris Armstrong, and Al Sedano of Resurrections- An Adam Warlock and Thanos Podcast to talk the first adventures of Robin, Changeling, Starfire, Wonder Girl, Kid Flash, Raven, and Cyborg as they face Deathstroke, Trigon, and the Fearsome Five! BONUS – stay tuned after the show for the panel’s quick spoiler-free thoughts on DC’s Titans show!